As office space becomes ever more expensive and limited, utilise unused urban rooftop and garden areas to maximise your office space. Aralia have experience in providing a full Design and Build service for this type of landscape project, working with companies to create a natural extension to their office space. Not only do Office Garden’s sway potential employee’s, but they also boost employee happiness. They do this by offering employee’s a relaxation zone within the workplace. 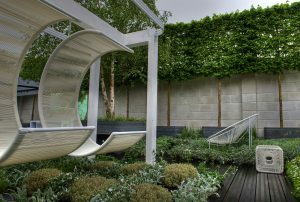 By adding tranquil outdoor seating (like these fun hanging ‘C’ shaped Swing chairs) or a Herbal Tea Bar (like at Chelsea Flower Show), you can transform the space into a haven of relaxation that provides a thought provoking working environment, in the midst of a concrete jungle. Relaxing office spaces improve productivity, and also encourages employees to stay in for lunch breaks, meaning social interaction which will help to build a sense of community, improve office morale and leave more time for brainstorming amazing ideas. Office Roof Terraces enhance and improve your company then, and can be used as a USP to make your company really stand out. Office Gardens encompass the indoor-outdoor living trend and receive copious publicity because of this meaning even if the garden is not visible it receives press and creates a buzz around the company. Furthermore, Office Gardens that are visible to passers-by can build a noticeable and recognisable brand. 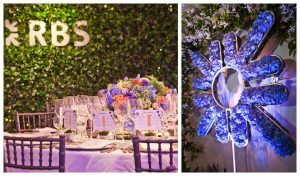 Make your garden emblematic and symptomatic with your brand by adding a Bespoke Personalised Piece like the one we created for RBS for their Charity Gala Dinner. In terms of company image, Office Gardens and Roof Terraces are ideal for companies striving for sustainability. You can opt for bespoke garden furniture made from up-cycled materials (like the furniture and Sustainable Bamboo Decking we used at CFS 2012). The inclusion of a Living Roof or Green Wall also increases biodiversity, is wildlife friendly, and makes strides in making your company recognized as sustainable. 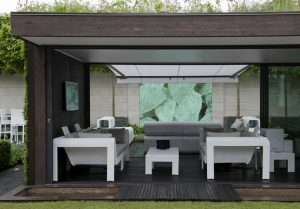 RHS Flower Show Garden 2012 ‘Rooftop Workplace of Tomorrow’, Copyright Aralia. Living Wall’s are multifunctional for Office Gardens as they also offer a stunning backdrop for corporate events and entertaining guests. An office Garden is in fact the ideal space for impressing and entertaining sponsors or advertisers – especially with the inclusion of an Outdoor Bar Island. We installed an Outdoor Bar Island with Built-in Outdoor Fridge for our clients at commercial office roof terrace ‘Ganton Street’. This inclusion transforms the Office Roof Terrace into the ideal outdoor entertaining space. Save money on hiring venues for company parties, and instead, make the investment of an outdoor space that provides a venue that is tailored to your brand. If your outdoor space is viewable from within the offices, use the garden to offer an inspiring backdrop for internal staff or for wowing external visitors. 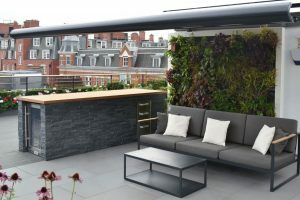 Aralia have experience of designing and installing Office Roof Terraces and Office Gardens, taking the project from concept through to full implementation. We have worked on previous Office Roof Terraces that cater for up to 200 guests for larger corporate entertaining, and are currently working on an Office Garden for a company Head Quarters (Romo) which will accommodate 300+ staff. In these Head office gardens we have designed an extensive garden which meets the high design level standards of the company. Office Gardens are ideal for companies like this which are heavily focused on visual graphics – such as Fashion Brands, Property Developers and Advertisers. Aralia work closely in collaboration with companies, making sure the space includes our award-winning touch whilst still exuding your brand. Capitalise on your unused outdoor space and install a roof terrace or garden to provide the ultimate extension for your working office.